REB has developed a complete line of semi automatic volumetric piston fillers and depositors, ranging from a single cylinder to multiple cylinder systems. Our three standard models of semi automatic machines, the SVS-J, SVS and DVS can be modified to meet your specific application. Our semi automatic fillers are pneumatically powered. They can be activated by a foot pedal (in manual mode,) or they can run continuously in automatic mode. All product contact parts are stainless steel or food grade plastics. For convenience, the fillers have piston stroke adjustment scales for accurately setting the fill volumes. 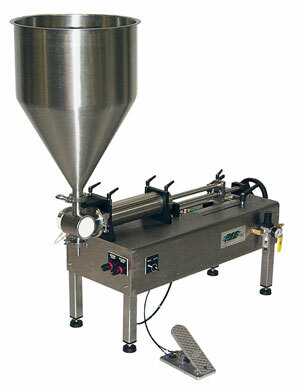 Each machine comes complete with one product cylinder, one nozzle and a product hopper. Click here to view full size animation. The SVS-J is our smallest piston filler, with a base of 19.5" by 9.5" and weighing approximately 35 LB. Interchangeable product cylinders range in size from .25 inches to 2 inches in diameter with a fill range from .2 to 8.5 fluid ounces. The SVS-J works well for lab use, start-up operation or small batch runs. The SVS-J has also been mounted on vertical and horizontal form-fill-seal machines. The SVS-J is used in many applications in the cosmetic, personal care and food industries. The SVS piston filler is the big brother to the SVS- J. It has the same design features only on a larger scale and with heavier duty components. The SVS can be supplied as a table top unit (as shown) or mounted on an adjustable stainless steel pedestal. The SVS can be supplied with additional interchangeable cylinder and piston assemblies to fill from fractional ounces to one gallon with a single machine cycle. The SVS also features a larger hopper and larger valve porting for filling chunky products such as potato salad and pie fillings. REB'S SVS provides accurate filling and depositing of products including pastes, frostings, gels, sauces, batters, oils and even thin liquids such as solvents. 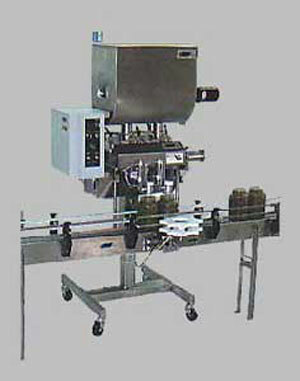 The DVS piston filler model is a dual cylinder machine. It has design features and pneumatic drive system are similar to the SVS. The DVS utilizes the REB end valve, with the product cylinder and dispensing valve in a single sanitary unit. The DVS is also capable of being supplied with large ported valves. T he DVS can be supplied as a table top unit or fitted to an adjustable height stainless steel pedestal. 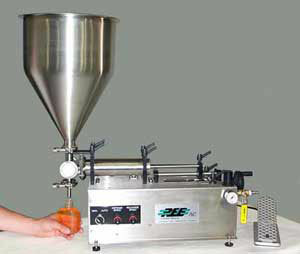 If you have higher production requirements, REB can supply mulitple head automatic filling systems.